A wheelchair that is designed for use in the shower allows seniors with limited mobility to carry out everyday tasks with or without the assistance of a caregiver to maintain their independent lifestyle. The bathroom is a common location for accidents and falls, so we’ve placed safety and convenience at the forefront of our reviews. Below, we’ll take a look at a few of the top shower wheelchairs on the market to help you or the senior In your life find a reliable solution. The chair is versatile as both a commode and shower wheelchair. 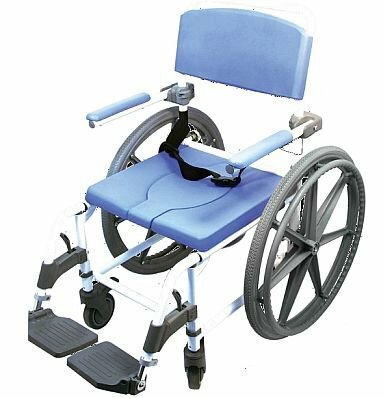 The EZee Life Shower Wheelchair is both a chair to use in the shower and a standalone commode in one unit. The width is a generous 20 inches. It has padded armrests, backrest, and seat to provide better comfort for seniors with sensitive or sore joints. You can move the arms up and out of the way to transfer to a bed easily if you manage limited-mobility. The footrest also pivots. The product has two 24-inch wheels and two 5-inch caster wheels that lock. Other safety features include an anti-tip add-on that makes it more stable along with a seatbelt. The frame is aluminum and rust-resistant. It’s relatively lightweight at 30 pounds. However, it is not easy to put together because of instructions that are poorly written and illustrated. It has a fixed height. The seat is a decent size that will accommodate most seniors comfortably. The chair is sturdy and well-made for added safety. 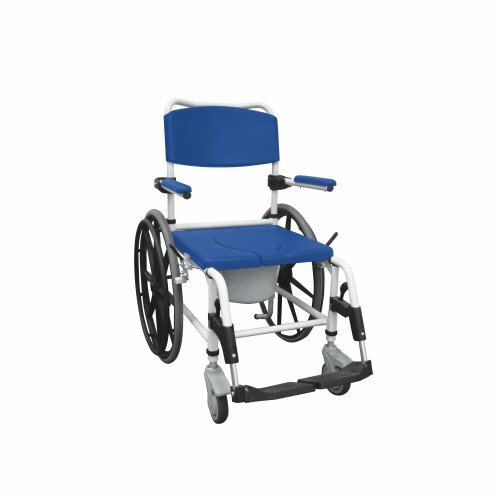 The Drive Medical Aluminum Shower Wheelchair is a bit smaller and narrower than the previous product and shares many of the same features. Seniors can use it as a standalone unit or over a toilet seat. The white aluminum frame is rust-resistant. It’s heavier at 41 pounds. Overall, it is well-made with proper weight distribution to make it stable for seniors to feel more secure using it. Both the armrests and footrests are movable, but it does not fold up for storage. Assembly was manageable and not overly complicated. On the downside, it does not have a seatbelt nor is one available for this model. The other concerns rest with the manufacturer’s limited return policy that includes extra fees for return shipping and restocking if it doesn’t work for you or your loved one. The chair is affordable and foldable as a portable travel unit that increases its value. 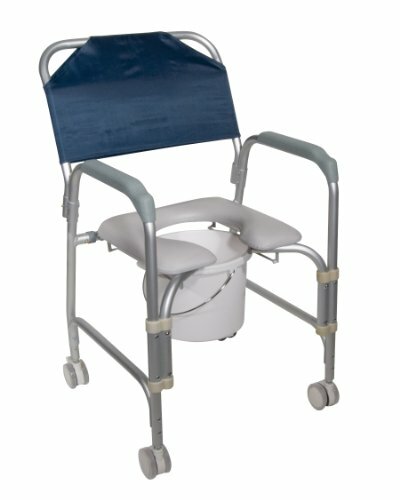 The Drive Medical K. D. Aluminum Shower Chair has a simple design with features that benefit both seniors and caregivers alike. It has an open front, making it an excellent choice for both men and women. It is lightweight and easy to maneuver. It has four caster wheels with the two in back locking for added safety. The seat is padded with waterproof material along the backrest. The chair folds up quickly, making it easy to store and use for travel. Despite its lighter weight, it is sturdy and well-made. Seniors can easily use it without assistance. It has a decent weight capacity, but the frame is narrower than we expected. You can’t move the armrests to the side which is another downside to an otherwise excellent product. It’s is value-priced as a second chair to have on hand. The shower chair is well-designed with features that make transfers quick and easy. The Invacare 6795 Mariner Rehab Shower Chair is a well-made and sturdy product as a solution for both the senior and caregiver. It has two caster wheels in the front with 26-inch ones in the back. Or you can purchase a set of four 5-inch casters if you prefer that style. The hard rubber seat has an open front for senior men and women yet is still comfortable and easy to clean for caregivers. Both the armrests and footrests swing out of the way for quick transfers. It also includes a seatbelt for added safety. You or your caregiver can fold up the chair for storage or transport. The aluminum frame is rust-resistant. It is a bit taller than comparable products which allow for its use over ADA toilets. The chair includes an insert to cover the opening when not in use. The stainless steel frame offers stability with a product made to last. The Bariatric Rehab Shower Chair is a solidly built product throughout the construction. It has a padded seat and armrests that swing out of the way for transfers. It has a stainless-steel frame that adds to its weight but increases its durability. The back tires are 20 inches with 6-inch caster wheels in the front. 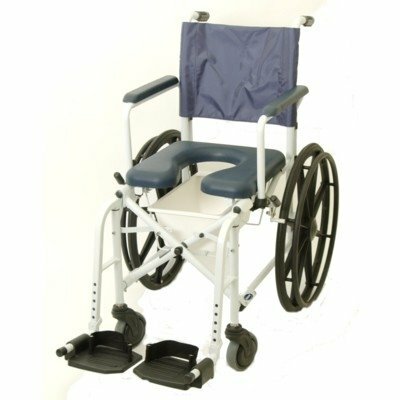 It is comfortable for the individual and easy to move for the caregiver on different surfaces. While the footrest is removable, it is not adjustable and may be high for some users. You can’t change the height either which can make it difficult for someone using it unassisted or with mobility issues. As a wheelchair with a toilet seat, it provides a solution for two tasks. However, it is quite expensive compared to the other products we reviewed. Like many assistive devices, it is not returnable. Now that you’ve seen a sample of what’s available let’s move on to discussing the features to consider. We’ll cover each one in detail along with some tips for making this essential purchase to support your independent living. One crucial thing that you need to bear in mind is that you may have limited options when it comes to returning a toilet wheelchair. Some manufacturers may not take them back. Or they may charge a restocking fee or shipping both of which are quite costly. That’s why it’s essential for you to review the product descriptions and terms in detail. Look for overall dimensions and those inside the frame too. Most models have seats that are at least 16 inches wide with many opting for 18 inches. That is the size of the standard toilet. We strongly urge you to measure it out, comparing it to a chair in your home so that you know what to expect. Pay attention to the height of the seat. That can affect how quickly you can get up from it, especially if you have a medical condition that limits your mobility. Some products are adjustable which takes out the guesswork to accommodate a range of issues. Also, check to see if you can adjust the height of the footrests, backrest, and armrests. All can play a substantial role in your comfort and ease of use. Assistive devices strike a balance between durability for the individual and maneuverability for the caregiver. Stainless steel exceeds when it comes to strength and affordability. However, these units are cumbersome and may pose difficulties moving it around on some surfaces, especially carpet. Aluminum frames are lighter and offer a decent compromise that you can use unassisted. We prefer a toilet wheelchair that has armrests and footrests that you can swing out of the way to make transfers easier. Look for products that have padding throughout the construction to make it more comfortable for you or your loved one to use. Materials like polyurethane provide plenty of cushioning that is waterproof with no-fuss cleaning for better sanitation. We also like to see removable backrests that make this task quick and painless. Take a look at the construction of the seat too. Less expensive models may lack the padding or have plastic or hard rubber instead. While still comfortable, they may not have the long-term durability that is essential for this purchase. It may also pose issues for individuals with limited mobility since it restricts its flexibility. We made it a point to delve into the details that speak to the challenge they will help you overcome. We also focused on products that make everyday life comfortable with affordability in mind. We considered the ease of assembly to the adjustability the product offers to the stability it has to determine its value for both you and your caregiver. Safety is another vital concern. Look for features such as locking caster wheels, anti-tip add-ons, and seatbelts. It’s also worth noting if the chair has slip-resistant components such as the tread on the tires. Seniors have a higher risk of falls and serious injuries that increases with age. The Centers for Disease Control and Prevention recommend these added features to make your home safer. Most products are expensive with some costing well into the thousands of dollars. Our advice is to read the descriptions carefully, noting all the features we’ve discussed above before you buy. As we mentioned earlier, many of these items are nonreturnable. While understandable, it makes for a pricey mistake if it doesn’t work for you and your situation. Bear in mind that it is an essential purchase nevertheless. So, don’t hesitate to get a costlier product if it has the specifications you need, especially if you anticipate heavy usage. The money spent up front is less than the price of a replacement. We strongly urge you to stick with manufacturers who offer warranties on their items to protect your investment. A toilet wheelchair that you can use in the shower overcomes the challenges of limited mobility and reduced quality of life. Many manufacturers go the extra mile with products that show attention to detail with features that make them more secure so that you can feel safe while using them. They are an excellent way to carry out everyday tasks and support your independent lifestyle.